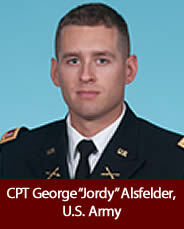 CPT George “Jordy” Alsfelder, devoted and loving son of Robert and Deborah Alsfelder and brother of MAJ Rob Alsfelder, CPT Will Alsfelder (Ret.) and Katherine Alsfelder passed away suddenly at Ft. Sill, Oklahoma on May 8, 2016 at the age of 26 of a heart attack while attending the Captain’s Career Course. He followed his two older brothers to the United State Military Academy at West Point, where he was a graduate in the Class of 2012. After graduation and commissioning, he proudly served in the 25th Infantry Division at Schoﬁeld Barracks on the Island of Oahu and deployed to Korea, the Philippines and Thailand as part of Paciﬁc Pathways. Jordy had a huge, contagious smile that made everyone around him happier. His quick wit and sharp sense of humor lit up a room and put a smile on everyone’s face. Jordy was an active, fun-loving person who played basketball, baseball, golf, dodgeball, and surfed, ran track, and enjoyed hiking, especially the hills and mountains on the Hawaiian Islands. He was an avid sports fan and had an especially strong love for Ohio State football and Indiana University basketball. Jordy cared about his family and friends much more than he cared about himself. He was proud to serve his country with honor and considered it a privilege to lead soldiers. His passing leaves an enormous void in the lives of so many that will never be ﬁlled.